This Gift Tin features Chocolates embossed with "Jesus Sweetest Name I Know" and individually wrapped in the "God So Loved Me That He Gave Me You" theme and scripture verse. Tin is embellished with an elegant bow and hang tag. Makes a great Valentine’s Day or Mother's Day gift. 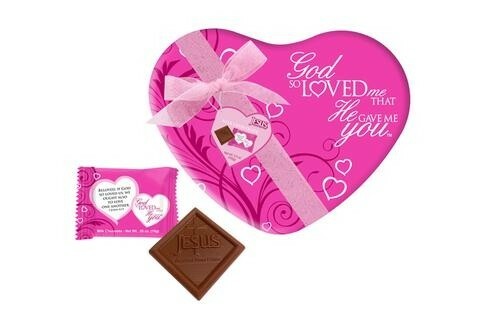 This Pink heart-shaped tin is filled with 3.5 oz. of milk chocolate. Allergy Information: Manufactured in a facility that also processes egg, wheat, and peanuts/tree nuts. Contains: dairy and soy ingredients. May Contain: traces of peanuts, hazelnuts, almonds, walnuts, and/or cereal-derivatives.